Panzertruppen of the 6th Panzer Division board Panzerkampfwagen 35(t)s during Operation Barbarossa. The Skoda Works in Pilzen, Czechoslovakia's major arms manufacturer, built the light tank model 35 starting in 1936 and successfully exported it to a number of countries prior to the German annexation in April 1939. Initially it had developmental troubles with its innovative pneumatic steering that relieved stress on the driver but eventually the LT-35 had an well-regarded reputation. After Czechoslovakia was incorporated into the Reich, the LT-35 was replaced with the LT-38 on the manufacturing lines. Designated as the Panzerkampfwagen 35(t) ("t" for Tschech - Czech) it was used as an equivalent to the Panzer III, because it was armed with a 37mm (1.46 inch) main gun and two 7.92mm (.31 caliber) machine guns. However the tank was not as capable, with a less capable gun and lighter armor. 219 were taken into the Wehrmacht for operations in Poland and France. 105 were issued to the 6th Panzer in Summer 1941, making up the bulk of the unit's tank strength for Operation Barbarossa in June 1941. Already obsolete, the 37mm main gun could not penetrate the Soviet KV and T-34 tanks. The pneumatic steering, not designed for Russian winters, broke down in the cold. The men of 6th Panzer took to using blowtorches to unfreeze their transmissions and engines, which caused more than one vehicle to explode or burn. On December 10, 1941, the last tank, nicknamed "Anthony the Last," was lost. The dwindling cadre of panzertruppen called the unit "6th Panzer of the foot" and relied on over 1,000 panje (Russian horse) wagons for carrying their remaining equipment when all their vehicles were lost. By January 1942 only 1,000 men (out of some 16,000 at the start of Operation Barbarossa) and three guns were operational, but 6th Panzer kept the supply lines open for 9th Army in Rzhev open, allowing the Wehrmacht to regroup and attack in the Spring. 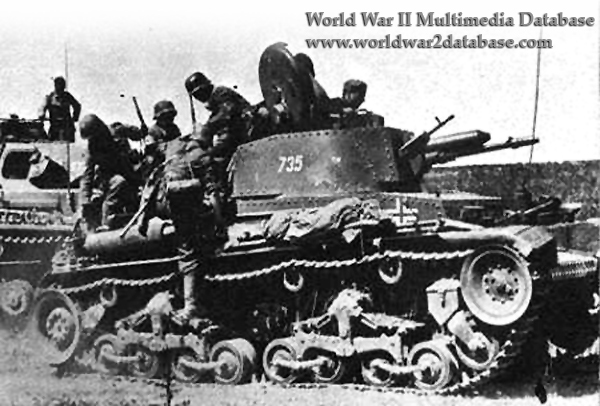 6th Panzer was rested and refitted with Panzer IIIs in France, but was rushed back to the Soviet Union when Stalingrad was surrounded in November 1942.